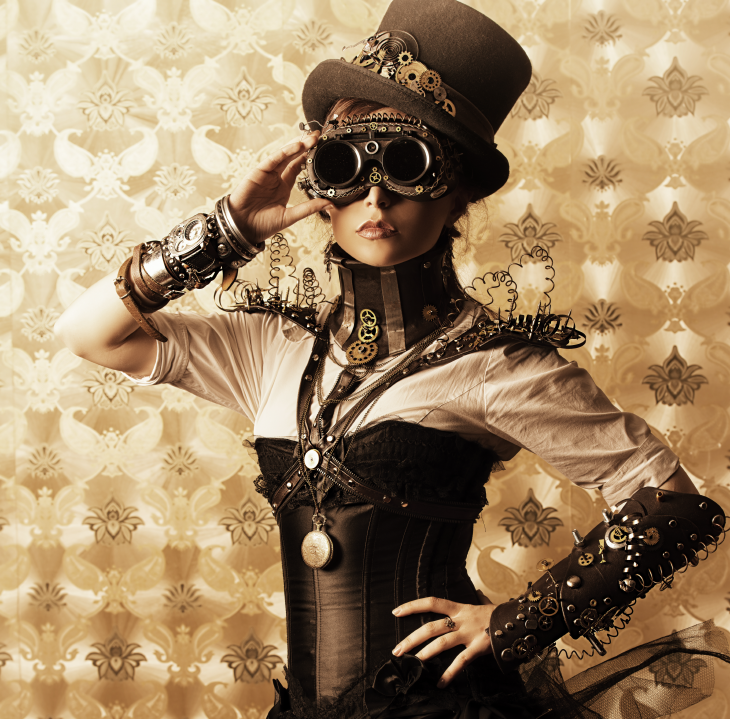 Steampunk fashion is derived from the steampunk literary tradition. Steampunk began as a genre of books that combined Victorian age steam technology with futuristic inventions. The term steampunk made its first appearance in 1987 by the author K.W. Jeter as an alternative to the term cypberpunk. Jeter’s novel, Morlock Night, is inspired by 19th century settings. Steampunk fashion takes its leaf from the pages of such books as The Time Machine by H.G Wells and Twenty Thousand Leagues Under the Sea by Jules Verne. Steampunk fashion takes its cue from the Victorian ages. Corsets, lace, and top hats all make their debut. Futuristic elements involving inventions are also used. Rivets, gears, buttons, mechanical hearts, wings, and other elements are commonly found. The color brown is a predominant hue. Details such as cameos, ribbons, clocks, and canes can be found in many of the ensembles. Pinstripes and parasols are used as well. Elaborate makeup, with heavily lined eyes and red lips is common. The Victorian Age in England lasted from 1837 until 1901. It is named after Queen Victoria who reigned in England during this time. The Gilded Age in America lasted from the 1870s until the early part of the 1900s and coincides with the latter part of the Victorian Age. The corset, so famous during this time, first made its appearance in Italy during the 1500s and was introduced to French women by Catherine de Medici. Throughout the centuries, the corset has changed its shape. Now most corset shapes are the hourglass figure, but other shapes, such as a reversed conical shape were also popular. Whalebone, wood, horn, metal, and other materials were typically used to create corsets and busks, which is a flat piece sewn into the corset to maintain its shape. Evening gowns had low necklines and short sleeves and worn with short gloves or fingerless lace gloves. Bustles, used as framework in the back of a dress to keep the shape and prevent the dress from dragging, became popular. Riding clothing included a matching jacket and skirt with a top hat and a veil. Lace-up boots were typical and jewelry was ornate, with cameos, gold, and jewels galore. Steampunk certainly has its own twist on traditional Victorian fashion. Whereas Victorian fashion was modest and demure, steampunk takes up the hem lengths of skirts and dresses. In Victorian times, corsets were an undergarment only, used to accentuate the curves of women. In 1983, Jean Paul Gaultier introduced the corset as outerwear for the first time. Other designers, such as Bestey Johnson followed suit. Now corsets are a popular fashion item that has been wholly embraced by the steampunk community. Along with corsets, brightly colored hair, tattoos, and fishnet stockings are part of the fashion genre as well. Anything but prim and proper, steampunk mixes taboo with the antique. WhiteClouds is a 3D printing service company and we have a selection of 3D printed steampunk jewelry, smartphone cases, and even dinosaurs and dragons to suit your needs. If you have an idea, WhiteClouds can 3D design it or 3D print your creation.